The 265 successful examinees of Dentist Licensure Examination (practical) this December 2013 are now listed below. You can now find your name or your family name below by pressing the Ctrl + F key in your keyboard. 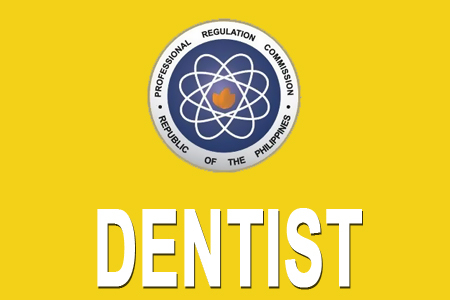 The Professional Regulation Commission (PRC) announced that 271 out of 580 passed the November 2013 Dentist Licensure Examination in Written Phase and 265 out of 281 passed the Dentist Licensure Examination in Practical Phase given by the Board of Dentistry in Manila this December 2013. PRC said, "The results were released in six (6) working days after the last day of examinations." Comments or suggestions about "December 2013 Dentist Board Exam results released" is important to us, you may share it by using the comment box below.